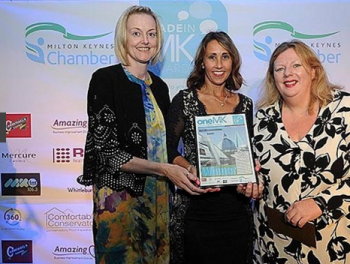 Last week OneMK hosted an event to honour all Milton Keynes local independent traders. The awards evening on Thursday, 15 September celebrated everything that is Made In MK. 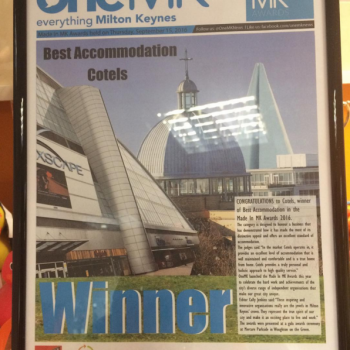 The ceremony was hailed a huge success and Cotels was thrilled to have been presented with an award for best accommodation in Milton Keynes. The winners of the 10 categories were announced at the presentation ceremony at Mercure Parkside in Woughton on the Green, Milton Keynes. Cotels accommodation in Milton Keynes includes one to three bedroom serviced apartments in different locations with quick and easy access to shops and a number of other amenities. The apartments offer far more space versus a cramped Hotel room. More living space and a home-from-home experience with fully inclusive rates are just a few of the advantages. Our Milton Keynes serviced apartment locations also provide an excellent temporary housing solution if you are re-locating to the area while searching for a more permanent home, if you need a stop-gap when moving home, or as a perfect get-away for leisure travellers.